Variety is reporting Keanu Reeves and Alex Winter will re-team on “Bill & Ted Face the Music” — the third installment of the comedy franchise. Original creators Chris Matheson and Ed Solomon have penned the script, with Dean Parisot (“Galaxy Quest”) confirmed to direct. Scott Kroopf (“Limitless”) will produce with Alex Lebovici and Steve Ponce of Hammerstone Studios, with Steven Soderbergh executive producing alongside Scott Fischer, John Ryan Jr., and John Santilli. MGM owns the rights and will release in the U.S. under the Orion Pictures banner. Bloom is handling international sales, which commenced in Cannes this week. Endeavor Content negotiated the deal. The original film saw the slacker duo travel through time to assemble historical figures for their high school history presentation. In the new film, middle age and the responsibilities of family have caught up with these two best friends, who have not yet fulfilled their destiny to write the greatest song ever written. 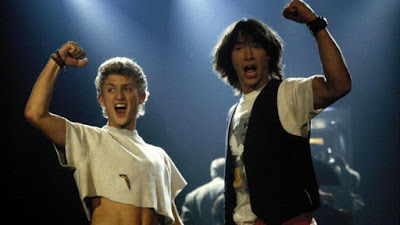 With the fabric of time and space tearing around them, a visitor from the future warns that only their song can save life as we know it — forcing Bill and Ted to set out on a time travel adventure to seek the song. Too excited to see this one! Absolutely love the idea.